A quaint bit of foolery exists nestled among the Hocking Hills Region of Southern Ohio. Ravenwood Castle and Medieval Village offers a full sensory dining experience. The castle was erected less than ten years ago, but has the look and feel of an old English structure. A Coach House Tea Room also offers a tasty brunch, with a view. Owners Sue and Jim Maxwell have created a majestic dining experience, at reasonable rates for both locals, and travelers to enjoy. Themed weddings, and overnight lodging are also available. A customer can enjoy a hearty meal, browse the Little Gift Shops of Ravenwood, and spend the night in either a castle room, or a gypsy wagon, also located on the property. Traditional “Old English” dining is available in the Great Hall main dining room. Should the ever frequent crowd pose a long wait, a pub provides lively music and a large variety of drink options. Reservations are strongly recommended before traveling the rustic road to reach Ravenwood Castle. Travelers who believe getting there is half the fun, will surely enjoy the scenery along the curvy country road leading to the establishment. The nearby Vinton County Airport, which many small engine pilots call home, routinely brings diners to the location for a fee. While traveling along Bethel Road one will encounter many varieties of wildlife, both horse and buffalo pastures, and even the occasional wild board. Beginning at 7 p.m. Monday through Thursday a three course meal is served for $24.95 per person. Lasagna is by far one of the most popular items on the menu. On Fridays, from 6-7:30 p.m. a buffet is offered for $19.95 per person. Saturday evening boats a delicious four course candlelight dinner for $28.95 per person. Sunday, beginning at 6 p.m. a seasonal supper buffet is available for $15.95 per person. A buffet at Ravenwood Castle is truly in a league of its’ own. A healthy, and hearty meal will leave even the hungriest customers quite full. The aroma, and juicy tenderness of the prepared meats, and tantalizing desserts are sure to please both children and adults. The Coach Hose Tea Room is open from May through October. Any given Thursday through Sunday, a light lunch, assorted teas, and various gourmet goodies are served. The signature “lunch and books with a British flavor” brings the scores of diners who are searching for a refreshing, and slow paced experience. Sweets and treats are a staple of the afternoon tea, with something to entice almost everyone on the menu. While waiting for a table, or perhaps a part of the overall experience, diners can tour the area unguided. The Pavilion in the Woods occasionally offers performances, and the fall leaves glistening on the rolling hills also entice nature lovers to spend a day at Ravenwood. Fiddlestix, and the Little Shops at Ravenwood feature rustic, and natural gifts, many unique only to the Appalachian region. Guided tours of the castle rooms also offer a glimpse into the vast attention to detail the couple exhibited when designing the themed restaurant. Old hardwood furniture, deep rich colors, and a general Knights of the Roundtable mystique add to the dining experience. Large canopy beds, Jacuzzi suites, and typical English gardens provide an atmosphere of serenity, and intrigue. A Sherwood Forest, Rapunzel’s tower , and Duke’s Dungeon are favorites of visitors. The many fireplaces throughout the castle are the only flames allowed at the entire non-smoking facility. Cell phone service is practically non-existent at the remote location. Catering services are also available for both intimate gatherings, or large groups via the Chef’s on staff at Ravenwood. Special holiday dinner and lodging packages are often offered. The Valentine’s Day romance, and winter cabin fever packages are quickly filled, and customers should plan on booking far in advance of a planned stay. Rental of the Pavilion in the Woods for special events can be secured for $375. Electricity is available at the site, with plenty of shade and parking also available. Two dressing benches and seating for approximately fifty people, and four tables are also provided. No alcohol is permitted in the pavilion area. Booking either indoor, or seasonal outdoor weddings at Ravenwood come with many special touches. An indoor castle wedding for the couple, and a two friends a small wedding cake, a chilled bottle of champagne or sparkling juice, and two souvenir etched champagne flutes for $250. A larger ceremony for up to 45 people jumps in price to $8,200, and is available from mid-April through mid-November. Value for the price far above average. 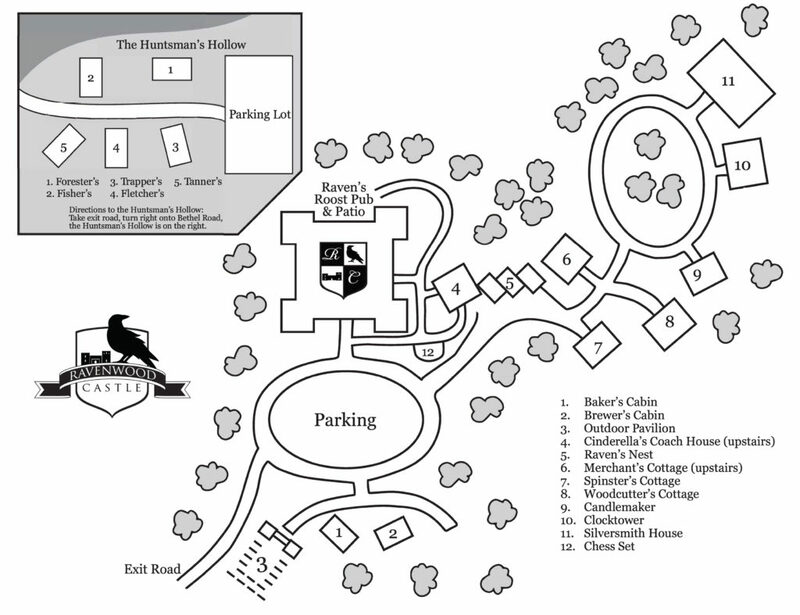 Use of the Ravenwood Realm for an entire weekend for the couple and all guests, use of the Great Hall or outdoor ceremony location, dinner with cake and toasting bottle, and the attractive etched flutes. Couples may either bring their own pastor, or phone numbers can be provided for area officiates, florists, and photographers, and musicians upon request. .The meals are delicious enough to stand on their own in any environment, but the themed concept enhances the experience immensely. 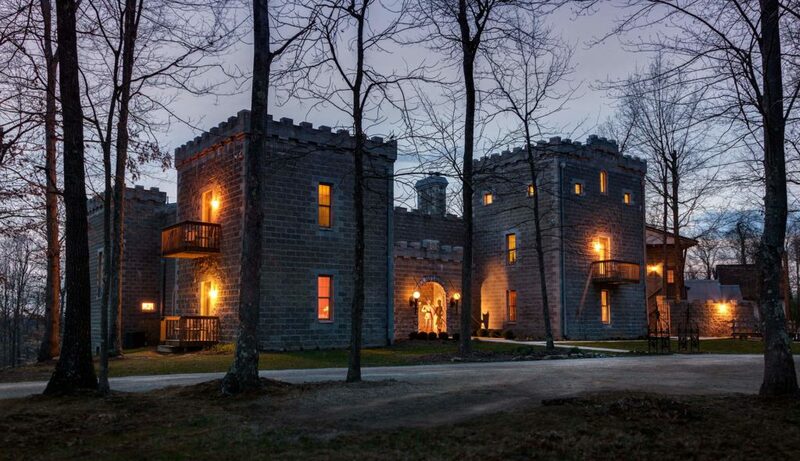 Ravenwood Castle is located at 65666 Bethel Road in New Plymouth, Ohio. Reservations can be made by calling: 1-800-47-1541, or 740-596-2606. Additional information can be found on the restaurant website at www.ravenwoodcastle.com.